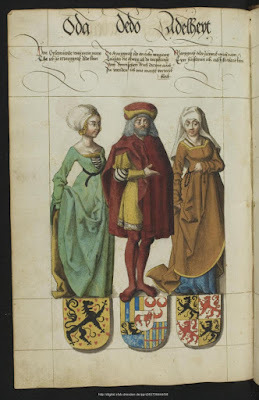 Coming to the conclusion of our review of some of the alternate blazon schemes suggested at times by different heraldic authors, we present you with not one, not two, not three, but four different blazon schemes based on the Virtues. Found in Eugene Zieber, Heraldry in America, 1895, attributes these to “Planché’s Clark”, but I do not find them in my copy of Clark (1882). I'm not at all sure why no virtues are given for green and purple in this scheme. Many of the virtues here match those of the ones proposed in the one Zieber ascribes to Planche's Clark above, but not all, hence its inclusion here separately. And, again, these schemes can create some very odd-sounding blazons. For example, my own arms would be blazoned by Berry as: Hope two chevronels justice between three apples charity slipped and leaved strength. I would note here that the Canadian Heraldic Authority has added Copper as a third metal in heraldry, along with Or and Argent. It is, however, a bright copper color, and not the tarnished copper green suggested in this blazon scheme. Not necessarily something I'd suggest basing blazon upon, but at least it has the advantage of having seven elements to match the seven standard heraldic tinctures. This scheme can give you some very strange-sounding blazons. For example, my wife's assumed arms would be: Phlegmatic semy of sexfoils serious. And France Modern would be: Sanguine three fleurs-de-lys blithe. 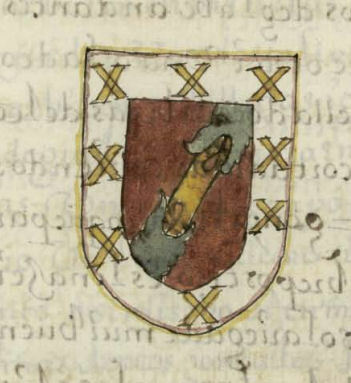 Nope, don't care much for this blazon scheme. At least this scheme has the advantage of (mostly) relating the colors of the flowers to the heraldic tinctures. Scabiosa comes in a dark burgundy color that I suppose can pass for black, but it also comes in a light blue color, which could be confusing for those more familiar with the flowers than with heraldic tinctures. And, too, if you have a coat of arms with flowers on it, or a badge even, such as the Tudor rose, it could end up sounding really weird: A rose rose charged with another lily (or, On a rose rose a rose lily). And heaven help you if you've got a lily of any color but white. I'm afraid I don't understand this scheme at all. I mean, I know that late medieval writers ranked the heraldic tinctures in a hierarchy, but none of the hierarchies I can recall put them in this kind of order. So I'm at a bit of a loss to understand this one. 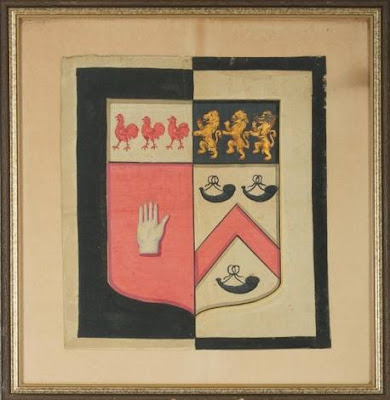 I ran across another armorial which has been scanned and uploaded on-line the other day. This one struck me particularly because it is actually a little less about the heraldry and a little more about the individuals who bore them. 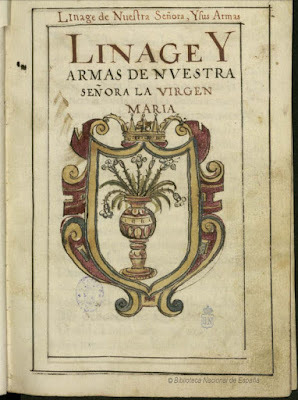 It's always interesting to me to see the different ways in which such books of arms are done, and this one is a particularly fine example of this. If you happen to be interested in German mid-16th Century costuming (I'm not, myself, but still...), it's a great resource for that, as well. It also contains, as many armorials from this time period do, a number of attributed arms, e.g., Alexander Magnus (Alexander the Great), Azure three bells or. I have also saved a link to it in the "Some Good On-Line Armorials and Ordinaries" section down the left-hand side of this blog, so it will always be here for you. Or maybe this could be subtitled, "Ministry of Silly Blazons" or some other such Monty Python-esque title. Anyway, having done planets and gemstones as alternatives to the usual names of the tinctures in English blazon, we turn to some of the even more esoteric (and never used) blazon schemes. In an attempt to keep some of these various blazon schemes organized, here are four which are thematically linked: blazon by Signs of the Zodiac; Seasons and Times of Day; Months; and Days. Yes, these have all actually been promoted by one heraldic author or another as a way, I have to assume, to make heraldry even more esoteric and difficult to understand. There are times that I just love living in this day and age! "Why is that," you ask? Well, because with today's technology, and the willingness of increasing numbers of libraries and archives from all over the world to scan and upload some of their holdings, it means that I can find, look at, research in, and often download armorials and other books about heraldry of whose existence I might not even otherwise know, or ever get to see even if I did know about them. 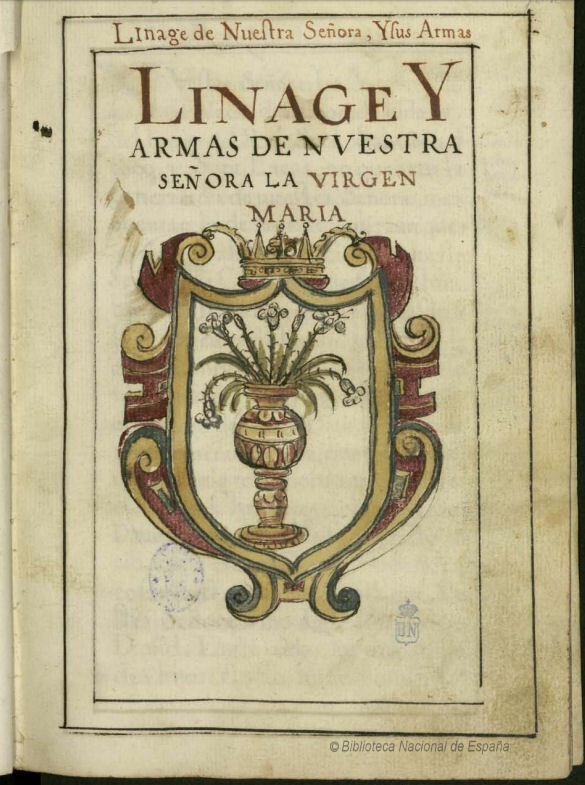 A case is point is this one: a manuscript copy of Genealogía de varias casas (Genealogy of various houses), which has been digitized and uploaded by the Biblioteca Nacional de España, the National Library of Spain. goes on through the lineage and arms of the Twelve Tribes of Israel, and eventually, within its 588 folios, the lineage and arms of a lot of Spanish families, such as the typically Spanish shield of the Gallegos family. It's a wonderful work, into which somebody put an awful lot of work, and now it has been scanned and uploaded by the BNE to be seen, and downloaded (in three separate, large .pdf files) by folks like you and me. That page will show you the three .pdf files, allowing you to click on one and then page through it (or there is a link by each one allowing you to download it), or if you click on "Mostrar miniaturas", you can scroll through thumbnails of every page in the complete volume. Heraldry enthusiast, President (for thirteen years) of Norsk Heraldisk Forening, and friend, Hans Cappelen of Oslo, Norway, has created a new website onto which he is uploading his articles about heraldry and flags to share with the rest of the world. The page is entitled, appropriately, Heraldikk og flagg (Heraldry and flags). 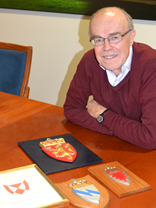 If you have an interest in Scandinavian heraldry and vexillology, or even more specifically Norwegian heraldry and vexillology, please drop by his page and see some of the articles he has uploaded there. Many of them are written in English, or at the very least have an English summary (very helpful for folks like myself whose comprehension of Norwegian is, alas, minimal). And, of course, there are pictures to help.